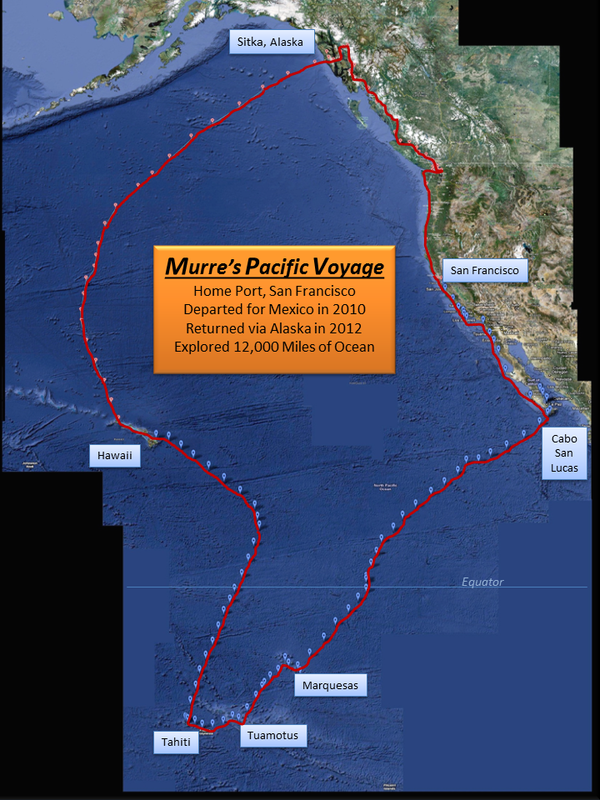 Note: on November 11, 2012, Murre sailed under the Golden Gate Bridge, completing her roughly 12,000 mile, two-year loop of the eastern and central Pacific. She is now comfortably ensconsed in a Sausalito marina awaiting her next adventure. The below reporting functions are no longer active but have been left up for the sake of interest. For your own peace of mind DO NOT assume that my failure to post positions during a passage means that Murre or Randall are in trouble. A number of things could be preventing me from reaching out: the computer fails, the radio fails, the sun is in the wrong position, land based stations aren’t taking my traffic, my batteries are dead, I’m too busy managing the ship, etc. Though important, this communication mechanism is a luxury and will always be secondary to keeping Murre safe and on course. Great to hear how life is going on Murre! The warm evenings and water sound like sweet therapy. Needless to say, it has been a long winter in Michigan. Just when you think spring has come to stay a storm blows through. Was in Traverse City this past Wednesday/Thursday and they had just received eight inches of snow. (No snow at home though thank goodness). Thursday was clear blue sky’s and the water there is emerald green Beautiful! Ever been there? Safe travels and may your adventure be unpredictably predictable. Unpredictably predictable is guaranteed, I think. Thanks for the note Rodney. Hope your cold winter is winding down. Ours is heating up. 90 degrees in the cabin yesterday…but only 60 degrees this morning. That’s life in the desert. One point of order: during passage I won’t be able to see this blog and so won’t be able to read or respond to comments. Uh Oh. Gear or boat problems? Looks like he’s headed back to the Marquesas. Just reading about your voyage, wonderful! I was born and raised in Sitka, and in the past year have fallen in love with sailing down here in the SF bay. Naturally, SF -> Kauai -> Sitka has become a dream of mine. Give a hollar if you need anything while in Sitka (if you’re still there, I have friends and family). When you make it back to SF do you plan to present your experience? Michael, thanks for the note. Sorry I’ve been so long in replying. Time in Sitka was great, wet, but great, and now am on th way south. Just departed Wrangell and am writing this short note while underway (it’s all engine here) to Coffman Cove, Meyers Chuck, and then Ketchikan.. Loose plan is to be back in SF by November. Let’s get together. not suggesting your information is not solid., but suppose you added a title that makes people desire more? I mean Where is Murre? | Murre and the Pacific is a little boring. excited about everything’ve written. Just my opinion, it would bring your posts a little livelier.